Speed is directly related to Strength- so start working out! Workouts should include full body exercises. Common misconception: â€œI only need to strengthen my arms and coreâ€. Usually the first area to get cramped and fatigued are your legs. â€¢ â€œOuthouseâ€: this is a great workout that anyone can do without going to the gym. It can be used to determine a base level of fitness. This type of workout is both physically and mentally challenging, this can help simulate a downriver race. Physically you will start to get tired but mentally you will need to keep pushing in order to finish with a good time. Use this to gauge your fitness by doing it once a month. â€¢ Rubber band exercises: Use an athletic rubber band to strengthen the small muscles in your shoulders this will help prevent injury due the repetitive motions associated with paddling in a raft. These exercises are typically used to help rehab shoulders after surgery this website lists some good ones. Every paddler and team will be a little different as far as stroke length, pace, and power. In order to be fast you need all team members attempting a similar paddle stroke, whatever that looks like for your team. Whichever paddle stroke you are attempting always focus on sinking the entire blade, every stroke. This allows you to maximize the surface area of your paddle. Flat water sprint stroke: This stroke is meant to be used in class 1 & 2 water, Flat Water, it will be a higher pace while maintaining power. Use this as you exit a rapid and approach a calm pool, ramp it up through the pool! â€¢ Pace: Start with 60 strokes a minute and work up to 75-80 strokes a minute. The goal is to not sacrifice power for speed. Just because you are moving fast doesnâ€™t mean that your boat is moving fast. The faster you move the more important timing of each stroke becomes. Watch the person across and in front of you, match the timing of when their paddles enter and exit the water. â€¢ Paddle placement: You want your paddle to enter the water with a slight angle forward so by the time your blade is all the way in, it is still vertical. You want to avoid lifting water behind you. Try to not make big splashes. Whitewater stroke: This stroke should be used when paddling through class2+ up to class 5 whitewater and will be a little slower to ensure that the boat is on line. As you approach a rapid your paddle strokes should become longer, this will allow you to maintain control of the boat while hitting waves and going over drops. â€¢ Pace: Start with 60 strokes a minute and work up to 65-70 strokes a minute. Again, donâ€™t sacrifice power for speed and really sink the paddle blades all the way down in order to catch some of the green water below. â€¢ Timing: In whitewater timing your paddles strokes can be very challenging because one side of the boat is up in the air and the other is in a trough. Use your peripheral to watch the paddler next to you and make sure you donâ€™t over power the other side. â€¢ Training year round is the best option for paddling at a high level but is not always feasible so you should attempt a 9 week training period leading up to the event. â€¢ Outside the 9 week period, Start with 1 day a week, get the first practice scheduled and make sure everyone shows up. â€¢ While everyone is there schedule the next practice before you leave, the team should always know when the next practice is. More paddling is better. â€¢ Once you have 1 day a week scheduled and its working start planning the 2nd day a week. â€¢ During the 9 week period attempt 2-3 days a week of paddling based on what your team can do. â€¢ Ideally day 1 is sprint/head to head training, day 2 slalom and day 3 downriver. Finish each practice with sprints. 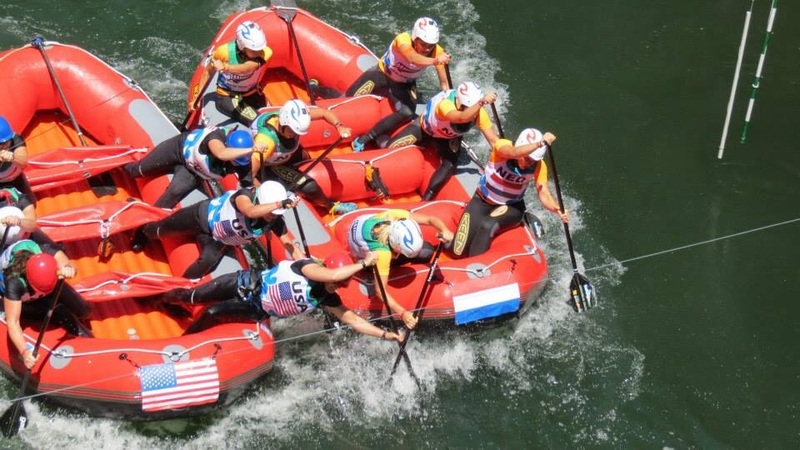 Here are a few great videos, they based on an outrigger stroke but most of it translates over to rafting.